NOTE: This product has been discontinued and is for educational purposes only! If you would like to build your own, please see the documentation on Github. The Reflowduino is a fully open-source Arduino-compatible development board that can painlessly transform any cheap toaster oven into a PCB reflow oven! It sports an ATmega32u4 microcontroller, thermocouple interface, LiPo battery charging, and Bluetooth Low Energy (BLE) capabilities for interfacing with a custom mobile app. Full documentation, comprehensive wiki, example Arduino IDE code and Android demo app for this product are available here. Note: All boards ship fully-assembled except for the headers. LiPo battery and micro USB cable are not included. 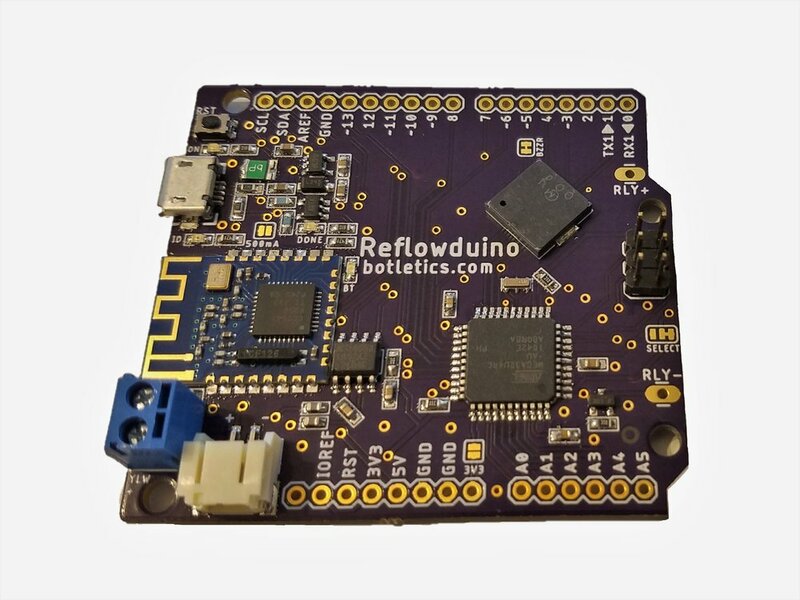 NOTE: The Reflowduino Pro has been discontinued. Please use the Reflowduino Basic or ESP32 and Reflowduino32 with the Sidekick Relay Module for easy setup! Have you ever considered making your own reflow oven but thought it would be too much work? Maybe you searched the web and even found some reflow oven controllers but with poor documentation and closed-source designs? Or maybe you thought about making one from scratch with an Arduino but soon realized that your bill of materials was growing rapidly and would end up in a tangle of wires? With Reflowduino that's all about to change! The Reflowduino is a completely open-source, all-in-one Arduino-compatible reflow controller board that can painlessly transform a toaster oven into a PCB reflow oven! It sports a versatile ATmega32u4 microprocessor with micro USB programming interface, an integrated MAX31855 K-type thermocouple interface with noise filtering, Bluetooth Low Energy (BLE 4.0) for easy communication with a mobile device, LiPo battery charging and status indication, an optional solid-state relay, and a piezo buzzer for playing cheerful melodies. Better yet, I've personally released what I've created as completely open-source for everyone to enjoy, including EAGLE PCB files, Arduino IDE example code, sample Android app for Bluetooth control, and full tutorials on how to modify a toaster oven! The Reflowduino Basic is ideal if you either want to customize your reflow oven build or quickly build a reflow oven without dealing with mains wiring. 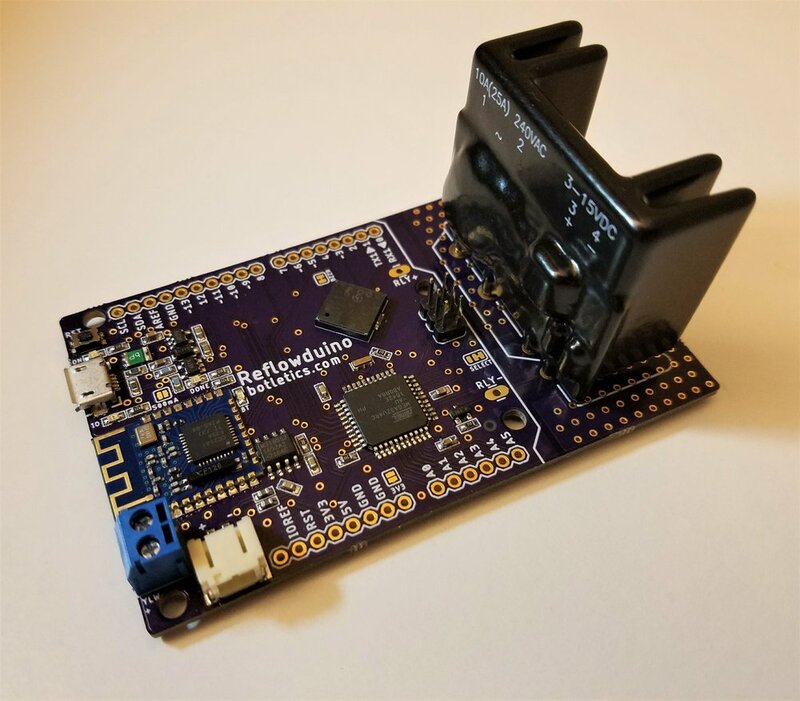 For the first option you would need to select and order your own solid-state relay since the Reflowduino Basic doesn't include one on-board like the Reflowduino Pro. 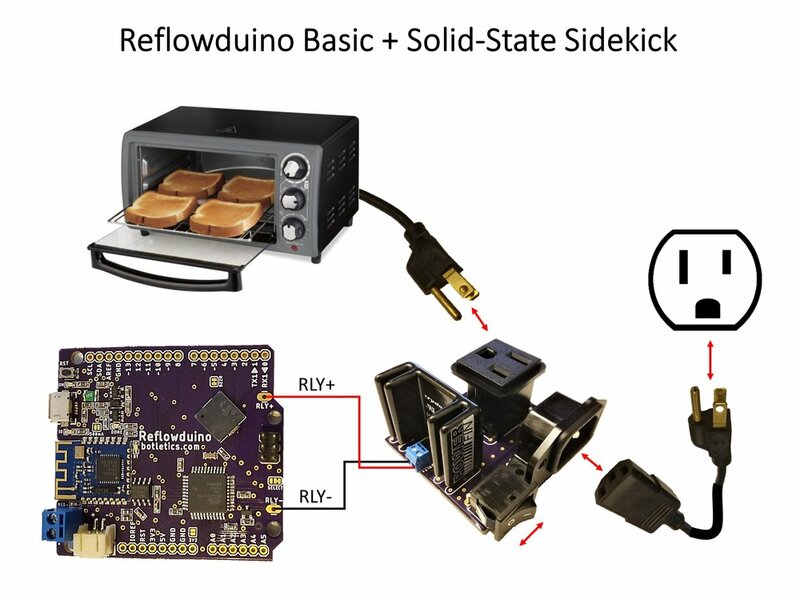 For the second option you would have to buy the Solid-State Sidekick, a solid-state relay module that allows you to control any appliance simply by plugging in the controlled appliance and connecting the two relay input wires from the Reflowduino. This allows for a fast and flexible reflow oven setup, and you can even disconnect the reflow oven and connect something else to control! The Reflowduino Pro includes a solid-state relay already on-board, leaving you with one less piece to worry about! This allows for a compact build and is perfect for retrofitting a toaster oven with custom displays and controls or easily creating a customized external power box that the appliance plugs into. Purchases of either the Reflowduino Basic or the Reflowduino Pro include a K-type thermocouple with glass-braid insulation as well as a loose kit of standard Arduino headers. The headers don't come assembled so you have the flexibility to choose your own headers or use none at all! Because the Reflowduino isn't in full-swing production, various parts may or may not be exactly how it appears in the pictures above. Such things could be the color of the screw terminal, the exact thermocouple brand, etc. However, none of these will cause any functional issues. Thanks for understanding!